I ADORE books! As a student I used to work in a book shop and my favourite thing was unpacking all the new books and having a wee nosey at them. I think it could actually be bordering an obsession. Personally I love giving books as gifts, especially to kids. What better way is there to instil a love of literature than by starting them young? Liz has a very similar attitude when it comes to her kids and Jonny and Sophie do enjoy a good book. 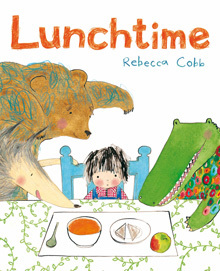 So imagine their delight when a new book arrived – Lunchtime by Rebecca Cobb. Over to Liz…. Jonny (my three-year-old) and I had a son-mum moment when we read the first two lines of this book: ‘At lunchtime Mum said, “Eat up.” I said, “No thanks, I’m a bit too busy”.’ We just looked at each other and laughed. ‘That’s like me’ said Jonny, and he was totally right. In fact, everyone who Jonny has read the book with has remarked it sounds exactly like him. In fact he thinks the book has been written about him and so the little girl is now a little boy (even though she is wearing tights and a dress…). The story goes on to tell of the little girl/boy sitting at the table refusing to eat her lunch while her mum goes off to do something else (I imagine her sitting with a lovely glass of wine in the garden). Eventually a crocodile, bear and wolf come and eat her lunch for her. Obviously mum is delighted when she returns to find the food gone and the girl goes off to play again. Throughout the afternoon her tummy begins to rumble and gets louder and louder until its dinnertime and you’ll have to read the book to see what happens. Lunchtime is a great book with lovely illustrations and not much text. Quite often we read it through once and then just go through the illustrations and tell the story in our own words (the book makes an excellent crocodile mouth to snap Jonny’s fingers too). As it is relatively short our one-year-old doesn’t get bored when we read it together. Therefore I use the book both as a quick read to fill a couple of minutes or as a much longer read when time allows. This is one of those stories that is so simple but it is definitely one of Jonny’s favourite books and I can recite it by heart. He absolutely loves it and finds it hilarious. Well done Rebecca Cobb! Lunchtime is widely available in Hardback with a marked price of £10.99. A review copy was received for consideration. No other reward, financial or otherwise, was received in exchange for this post. All opinions expressed are entirely our own.